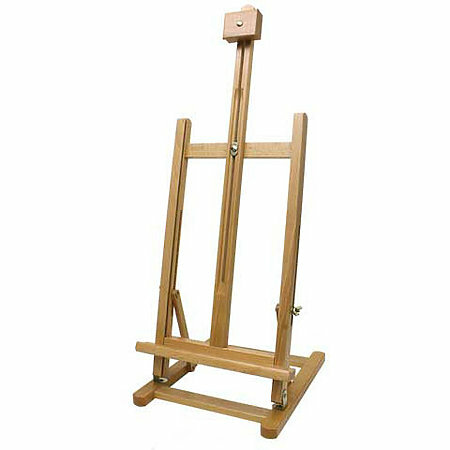 This versatile and stable H-frame table easel functions both as a working easel that can be used while standing or sitting, or as an elegant display easel suitable for any venue. Perfect for painting on smaller canvases or panels, it accommodates canvases up to 24"h and 1.5"d. Rubber feet protect table surfaces and prevent slipping. Folds flat for easy storage. Minimal assembly required, instructions included. Dimensions are 11.5"w x 32"- 40.5"h x 12.6"d. Weighs 3.5 lbs.